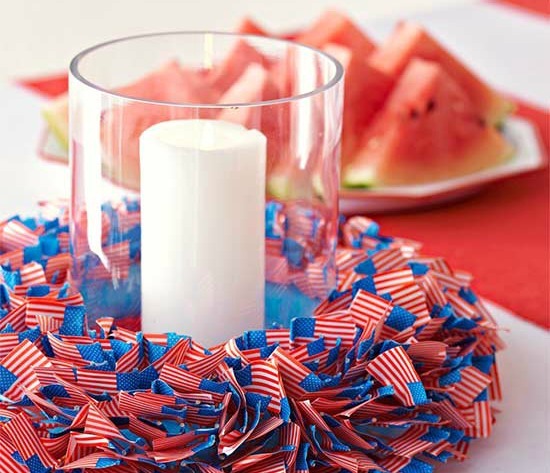 Make the flag the star of your 4th of July decorating with this easy centerpiece. 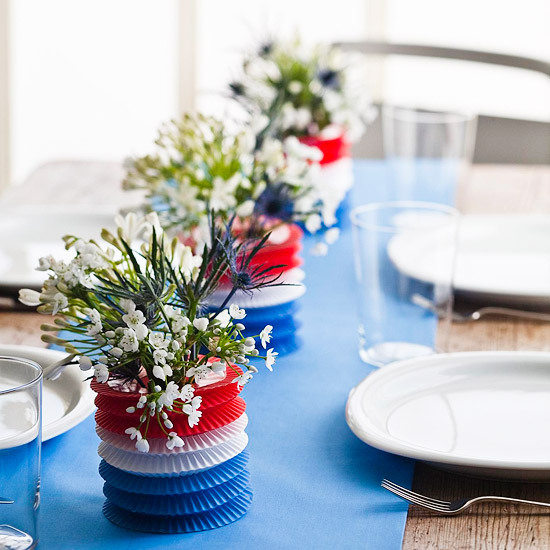 Tuck an American flag around the edges of a clear glass vase. 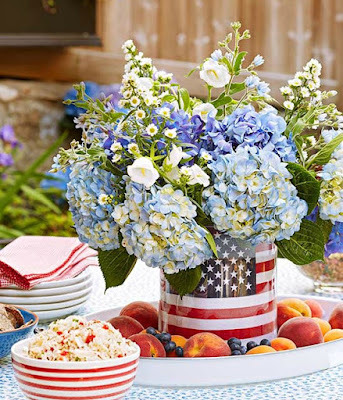 Then fill with your favorite red, white, and blue 4th of July flowers. A base of fresh, juicy fruit doubles as a serving platter and adds pretty color. 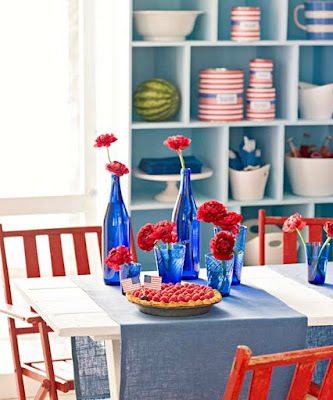 A collection of blue bottles and drinking glasses makes a charming 4th of July centerpiece, especially when filled with red, white, and blue flags or flowers. 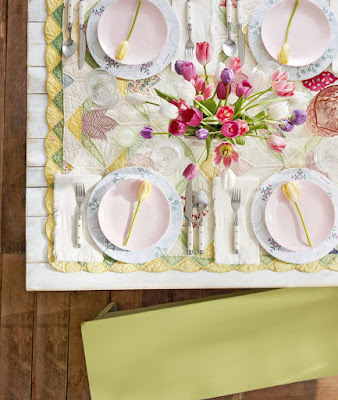 Tie the look together with a colorful table runner. 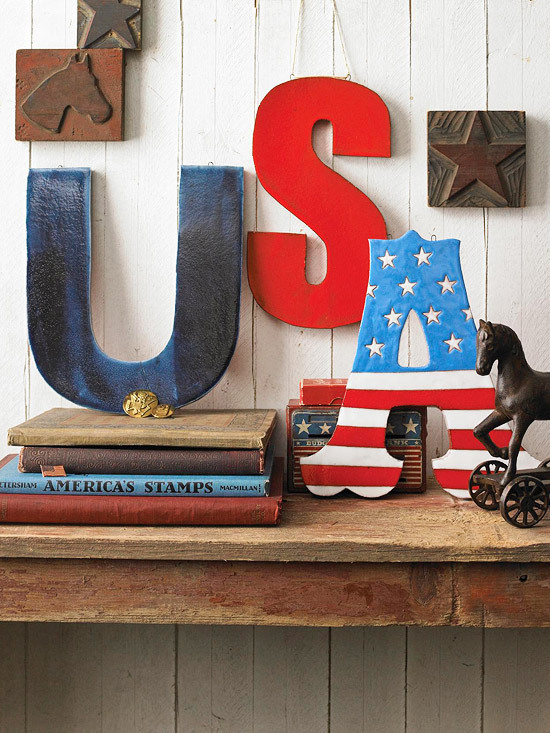 Show your American pride with these colorful letters. Buy plain wooden letters (available at crafts stores) and get creative with red, white, and blue acrylic paint. Mix and match solid colors with stars and stripes. 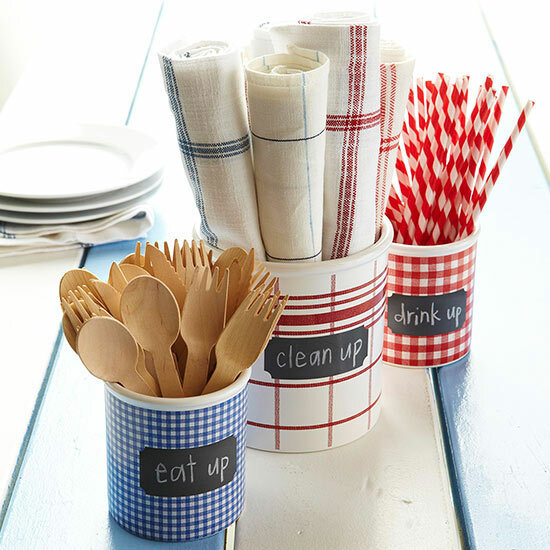 Spice up recycled containers (oatmeal containers work well) with scrapbooking paper to make simple utensil holders. 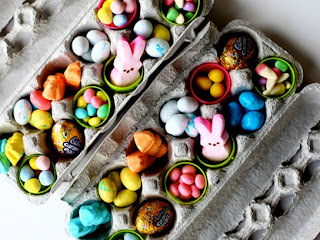 Cut paper to size, and use a glue stick to adhere to the outside of each container. Purchase a small amount of chalkboard paint to make easy labels. Create a fun and easy 4th of July table setting with purchased miniature American flags. 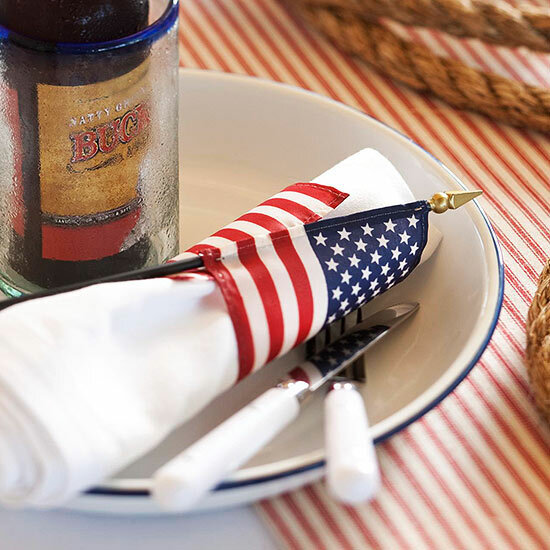 Just wrap each flag around a table napkin, pin in place, and you're all set. 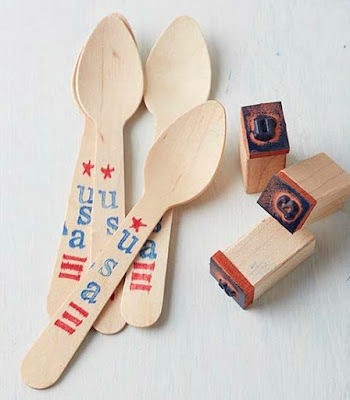 Make digging into the 4th of July feast a touch sweeter by decorating plain wooden utensils with red and blue ink stamps to adorn the handles of each utensil with stars, stripes, and other patriotic designs. Fans help guests stay cool on a hot day, but they can also double as DIY 4th of July decorations. 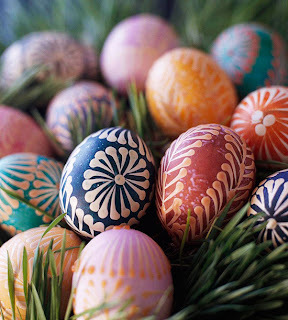 Find tinted fans at a local crafts store, or dip-dye plain white fans in red and blue dyes. Then hang fans on a length of twine above your bar. 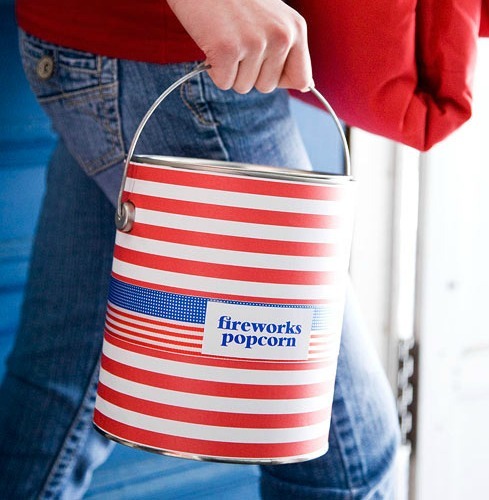 Make a colorful container for carting treats to the fireworks display. 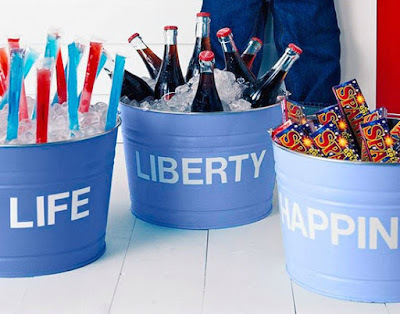 Cover unused paint cans (available at hardware stores) with red, white, and/or blue scrapbooking paper, and supply the kids with stickers and markers to personalize their cans. Line the inside of the can with a large plastic bag before filling with snacks. Get your red, white, and blue on at the dinner table this year—even plain buckets can get dressed up for the 4th of July! 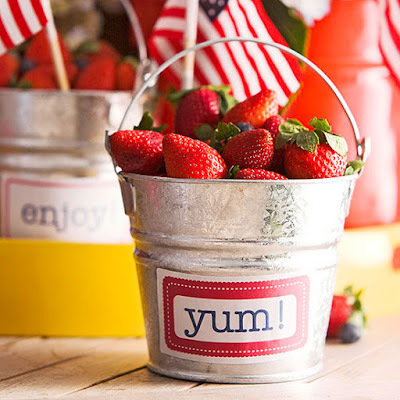 Use sticker labels or make your own with fun sayings like Yum! 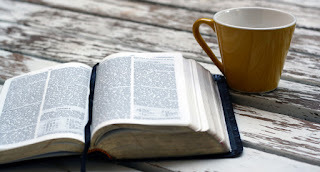 or Enjoy! Attach a label to the front of each bucket. 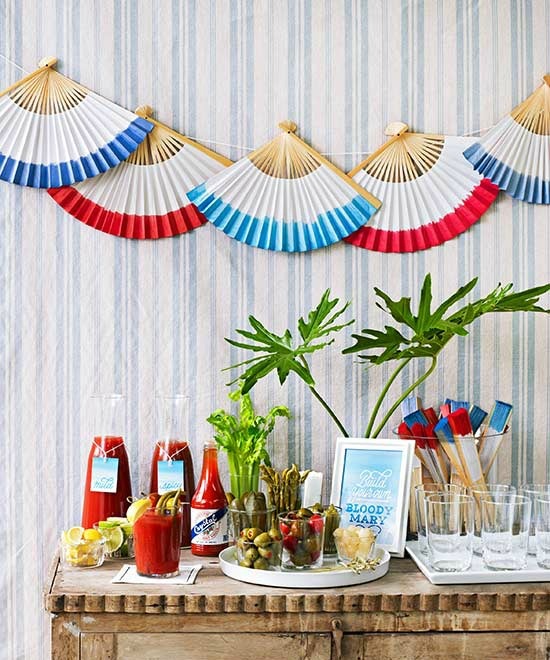 About 300 miniature flags make up this eye-catching centerpiece. 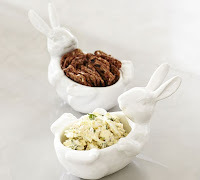 It's easier to make than you might think. Just wrap a foam wreath form in crepe paper, then insert flags until the wreath is covered for this simple 4th of July centerpiece. Transform red-white-and-blue striped paper lanterns into 4th of July centerpieces for your table. Just slip each lantern over a clear glass, and tuck a handful of white blooms inside.